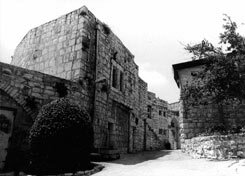 The village of Deir Yassin. The massacre at Deir Yassin is one of some two dozen documented massacres of Palestinian civilians by Zionist forces seeking to transform Palestine into a Jewish state. If the import of catastrophes were gauged only in numbers of people slaughtered, Deir Yassin may not have taken on its central role in the Palestinian national consciousness. However, the terror at Deir Yassin triggered a mass flight of Palestinians who feared for their own lives. When Israel was established sixty years ago this May, more than 700,000 Palestinians lost their homes and belongings, their farms and businesses, their towns and cities. Jewish militias, and later, the Israeli army, drove them out. Israel rapidly moved Jews into the newly-emptied Palestinian homes. This tragic event and its consequences lie at the core of the Palestinian/Israeli problem. 1. What happened in the Palestinian village of Deir Yassin and why does it matter today? In the early morning of April 9, 1948, three Zionist militias - the Haganah, Irgun and Stern Gang -- attacked the Palestinian village of Deir Yassin, located west of Jerusalem. More than 100 men, women and children were massacred. Some were mutilated and raped before being murdered. Twenty-five men from the village were paraded through Jerusalem and then executed in a nearby quarry. Those able to escape fled to East Jerusalem. Word of the terror attacks spread rapidly, causing many Palestinians to flee, fearing for their lives. Within a year of the massacre, Deir Yassin, which had been emptied of Palestinians, was re-populated with Jewish immigrants and its name was removed from the map. For Palestinians, Deir Yassin became the symbol of the sudden loss of their homes and homeland and the near destruction of their society, a situation which endures until today. When Israel was established sixty years ago, more than 700,000 Palestinians were exiled and 78 percent of the land of historic Palestine was lost. Today, Palestinian refugees number nearly four million, out of a total population of approximately ten million. They are still deprived of their internationally-recognized right to return to their homeland. In the West Bank, Israel continues to seize land for Israeli-only settlements and Israeli-only roads. 2. Who carried out the massacre? The Haganah, which became the Israeli army, fired mortars at the village while the Irgun and Stern Gang attacked from close range. At the time of the massacre, David Ben-Gurion, Israel's 1st prime minister, directed Haganah policy; Menachem Begin, Israel's 6th prime minister, led the Irgun; and Yitzhak Shamir, Israel's 7th prime minister, was a leader of the Stern Gang. 3. What resulted from the Deir Yassin massacre? As news of the massacre spread, the ensuing terror triggered the mass flight of Palestinians. A few days after the attacks, in fact, the Irgun asserted that the incident advanced "terror and dread among the Arabs in all the villages around, in Al Maliha, Qaluniya and Beit Iksa a panic flight began ..." The flight of Palestinian refugees fit into the plans of Zionist military and political leaders at the time. During the first week of April, a concerted campaign - known as Plan Dalet - to systematically expel Palestinians from areas sought for the soon-to-be-founded state of Israel went into effect. Zionist forces conducted eight major military operations against Palestinian cities and villages between April 1st and May 15th when Israel declared independence and Arab states intervened in response to the growing refugee crisis. Some 250,000 Palestinians had been expelled by then. 4. Was Deir Yassin an isolated incident? No. While Deir Yassin may be the most infamous, Israeli historian Benny Morris documents 24 massacres of Palestinians conducted by Zionist, and then Israeli, forces in 1948. According to Morris, "In some cases four or five people were executed, in others the numbers were 70, 80, 100. There was also a great deal of arbitrary killing. Two old men are spotted walking in a field - they are shot. A woman is found in an abandoned village - she is shot. There are cases such as the village of Dawayima [in the Hebron region], in which a column entered the village with all guns blazing and killed anything that moved. The worst cases were Saliha (70-80 killed), Deir Yassin (100-110), Lod (250), Dawayima (hundreds) and perhaps Abu Shusha (70).... The fact is that no one was punished for these acts of murder. Ben-Gurion silenced the matter. He covered up for the officers who did the massacres." The Irgun and Stern Gang also attacked British and United Nations institutions and officers who they believed stood in the way of the Zionist enterprise in Palestine. 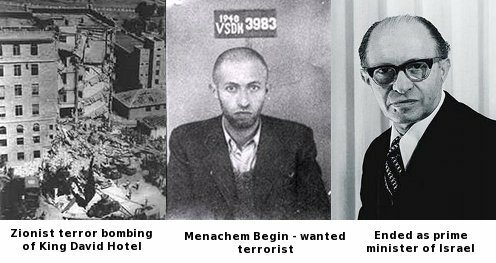 The Irgun was responsible for the bombing of the King David Hotel, which was used as British military headquarters, in Jerusalem in 1946. Ninety-one people were killed. The Stern Gang assassinated Lord Moyne, the British minister of state for the Middle East, in 1944, attempted to assassinate Harold MacMichael, the High Commissioner of Palestine, in 1944 and assassinated Count Folke Bernadotte, the United Nations representative in the Middle East, in 1948. 5. What was the total destruction and how it is still relevant today? In total, at least 450 Palestinian towns and villages were depopulated due to Zionist military attacks or fear of such attacks. Most of these were demolished. By the end of 1948, more than 700,000 Palestinians - two-thirds of the Palestinian population - were exiled and their society was destroyed. Even today, a Jew from anywhere in the world is welcome to settle in Israel, while Palestinians with the keys and deeds to their seized homes do not enjoy the right to return. Early in the morning of April 9, 1948, Militias of the Irgun (headed by Menachem Begin) and the Stern Gang attacked Deir Yassin, a village with about 750 Palestinian residents. The village lay outside of the area to be assigned by the United Nations to the Jewish State; it had a peaceful reputation. But it was located on high ground in the corridor between Tel Aviv and Jerusalem. Deir Yassin was slated for occupation under Plan Dalet and the mainstream Jewish defense force, the Haganah, authorized the irregular terrorist forces of the Irgun and the Stern Gang to perform the takeover. Part of the struggle for self-determination by Palestinians has been to tell the truth about Palestinians as victims of Zionism. For too long their history has been denied, and this denial has only served to further oppress and deliberately dehumanize Palestinians in Israel, inside the occupied territories, and outside in their diaspora. Some progress has been made. Westerners now realize that Palestinians, as a people, do exist. And they have come to acknowledge that during the creation of the state of Israel, thousands of Palestinians were killed and over 700,000 were driven or frightened from their homes and lands on which they had lived for centuries. Deir Yassin Remembered seeks similar progress on behalf of the victims of the Deir Yassin Massacre . . .
A grave for an unknown individual from Deir Yassin (Photo: Deir Yassin Remembered) On 9 April 1948, militants of the Irgun and Stern Gang attacked the Palestinian village Deir Yassin. In all over 100 Palestinian men, women and children were systematically murdered. This massacre is often cited as sparking the panic that led Palestinians being driven from their homes. Deir Yassin stands as the starkest early warning of a calculated depopulation of over 400 Palestinian villages and cities and the expulsion of 70 percent of the Palestinian population.